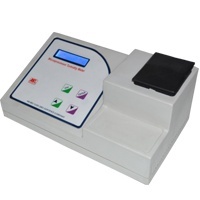 ME 88 – Micro-processor Turbidity meter with 16×2 alphanumeric LCD display having two range upto 1000 JTU with memory of storage of 2 standards to avoid frequent use of standard solution. Memory In built memory to retain both range standard solution and last set value even after power loss. Accessories Test tube set , Dust cover and Operational manual.